THE STORY - Political pressure mounts to install a system of accountability when the actions of the Avengers lead to collateral damage. The new status quo deeply divides members of the team. Captain America (Chris Evans) believes superheroes should remain free to defend humanity without government interference. Iron Man (Robert Downey Jr.) sharply disagrees and supports oversight. As the debate escalates into an all-out feud, Black Widow (Scarlett Johansson) and Hawkeye (Jeremy Renner) must pick a side. THE GOOD - Unbelievable special effects and action sequences with a screenplay that presents both sides of the argument making it tough to choose between Captain America or Tony Stark. THE BAD - Sometimes the action scenes can be murky and hard to make out what is going on amongst all of the chaotic action. Overstuffed in terms of characters. It appears we have reached a point in the Marvel Cinematic Universe where the film medium is becoming too small for these largely cast superhero films. When having to tell a standalone origin story or it's sequel with higher stakes, there is nobody who can do it better than Marvel. "Captain America: Civil War" is at its strongest when its epic story is boiled down to its smallest and most personal elements. It's when it starts to teeter into "Age of Ultron" territory of trying to juggle too many side characters and spends an arduous amount of time setting up the ultimate confrontation that everyone is paying a ticket to see that "Civil War" begins to stumble. If you're already a huge Marvel comic book fan, then this film will satisfy you in all of the ways that you're hoping for. However, if you're a casual movie goer who has only ever seen the previous films in this series, then some elements may leave you scratching your head more times than not despite the well thought out themes and grand action spectacle which is provided. ​Following one year after the events of "Age Of Ultron," The Avengers team (Minus The Hulk and Thor) are being handed a tough decision to make in regards to their future. The growing death toll of human casualties as a result of collateral damage is forcing the United Nations to take action to pass the "Sokovia Accords," which will establish an international governing body to manage and regulate the Avengers. Tony Stark "Iron Man" (Robert Downey Jr.) is completely in favor of the bill along with Natasha Romanov (Scarlett Johansson), James Rhodes (Don Cheadle), and Vision (Paul Bettany). Steve Rogers "Captain America" (Chris Evans) personally opposes, but then gets even more involved once his dear friend Bucky "The Winter Soldier" (Sebastian Stan) gets framed in a disastrous international terrorist attack orchestrated by Helmut Zemo (Daniel Bruhl). Captain America attempts to find Bucky and prove his innocence with the help of Sam Wilson "Falcon" (Anthony Mackie), Clint Barton "Hawkeye" (Jeremy Renner), Scott Lang "Ant-Man" (Paul Rudd) and Wanda Maximoff "Scarlet Witch" (Elizabeth Olsen). Now on opposing sides of the law, Steve Rogers and Tony Stark's conflict will draw others into the mix, including T'Challa "Black Panther" (Chadwick Boseman) who has a personal stake in the film's events and a young teenaged Peter Parker "Spider-Man" (Tom Holland). The one aspect of the film that the Russo Brothers and the screenwriters get absolutely right is the clash between Tony Stark and Steve Rogers. Their physical altercations are fantastic in their non-stop ferocity, but their beliefs over the Sokovia Accords and how they both raise interesting questions on the subject is where the film shines the most. Questions such as, when are The Avengers needed, who controls them, and are they no better than the villains they intend on stopping, is endlessly fascinating and gives the viewer a lot to chew on. The true genius in the film's conflict is that neither side is right or wrong and how the film presents this is phenomenal. Every character's motivations and decisions make sense. Also the consequences of their actions and how they affect the other heroes involved in the conflict follows logical reasoning. Which now brings us to the part that everyone has been waiting for...How are the action scenes in "Captain America: Civil War?" The airport sequence involving every main character is geographically coherent, endlessly exciting and consistently fun due to the comedic one-liners from some of the film's characters. There is a street chase scene which successfully introduces a new character into the Marvel Cinematic Universe with furious momentum and excitement. 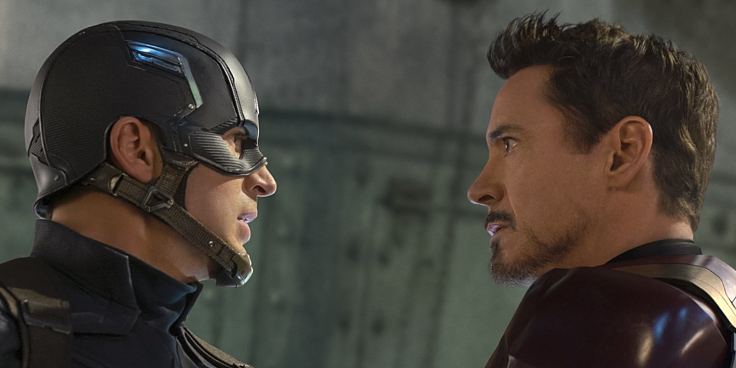 And the final climactic scene between Iron Man and Captain America takes a surprising route towards a more personal, hard hitting fight scene where every punch is packed with emotion instead of the chaotic "Let's team together to take out the true villain" ending, which the film teases leading up to the finale. The only action sequence that failed to deliver was the opening set in Lagos where Rogers, Natasha Romanov, Sam Wilson and Wanda attempt to stop Brock Rumlow "Crossbones" (A brief return from Frank Grillo). The shaky handheld camera work and jittery editing startle the viewer initially, but eventually settles before the film's end. And now we come to the mixed bag and that is the film's balance of its many captivating yet underdeveloped characters. Obviously, Tony Stark and Steve Rogers get the most amount of screentime and are handled with confidence and plenty of charisma by it's two perfectly cast stars. The relationship between Rogers and Bucky is fleshed out even further here as it was already well established with the first two Captain America films. However, at this point, the film does start to ask whether or not Bucky is worth all of this trouble for Steve Rogers. And we start to feel the same as well. The Winter Soldier, as he's called, was a fascinating subject in "Captain America: The Winter Soldier" but by retreading previous themes from that film with the Bucky character, it comes off as repetitious this time around. And it's here where "Civil War" loses its focus and halts its momentum on more than one occasion. The side characters start to feel shifted in favor of the leading characters when each of them are deserving of their own films at this point in Marvel's cinematic series. After the two leads come the upper tier characters, who get their brief moments of character development but are calling for their own stand alone films to be fully fleshed out such as Wanda and Natasha Romanov. I would say that out of all of the characters included here, it's the perfectly handled introductions of Blank Panther and Spider-Man which provides the bulk of the fist-pumping moments for fanboys and new fans alike. Credit has to be paid to screenwriters for utilizing a villain who isn't supernaturally powerful as the film's heroes like Ultron or Loki was. And although Daniel Bruhl is an inspired choice as the German Helmut Zemo and his motivations are keeping in with the film's theme, his methods and cunning genius are not given the necessary weight to be the film's focal point as an antagonist. By not allowing audience members to fully understand his motivations early on, he instead feels like an afterthought and by the film's end becomes entirely forgettable. Everyone else, from Jeremy Renner, to Paul Rudd, have their moments as well, but it's here that one gets the sense that the film is trying to do too much. The film is already stretching audience's patience by crafting the longest film yet in the MCU at nearly three hours long. After an epic fight scene at an airport one has to begin to wonder, how much is too much? How much are we willing to sacrifice in terms of character development and plot coherence, to create an action filled spectacle that can top the previous films that came before? "Captain America: Civil War" gets a lot right while making the sacrifice for other things along the way in terms of narrative coherence, character development (For some) and audience member's own patience and endurance. It's actually a terrific metaphor for the film itself which touches upon the consequences of having a powerful group of superheroes protect the world. Marvel's latest frustrates just as much as it entertains. Its insistence on never killing off a central character continually lowers the stakes for the group of heroes and the film leaves the central conflict open, which it will surely look to expand upon in future installments. But with each passing film, Marvel needs to understand (If they didn't get the memo after "Age Of Ultron") that bigger isn't necessarily always better and that when you strip a story down to its basic core and focus in on what's more important (In this case, the personal rivalry and conflicting beliefs of Captain America and Iron Man), you can end up with a film that touches upon cinematic greatness. "Civil War" will be just that for a vast majority of people, but for the rest, Marvel gets another well-earned pass...for now.